Investor sentiment was mostly buoyant across the four participating countries, with 75 percent of respondents saying their firm is likely or very likely to make a significant capital investment in the next 12 months. Business executives in the Philippines are mostly discontent with the domestic tax environment and have identified rising commodity prices as potentially having the biggest impact on the economy in the coming years, according to the latest survey of the Oxford Business Group. 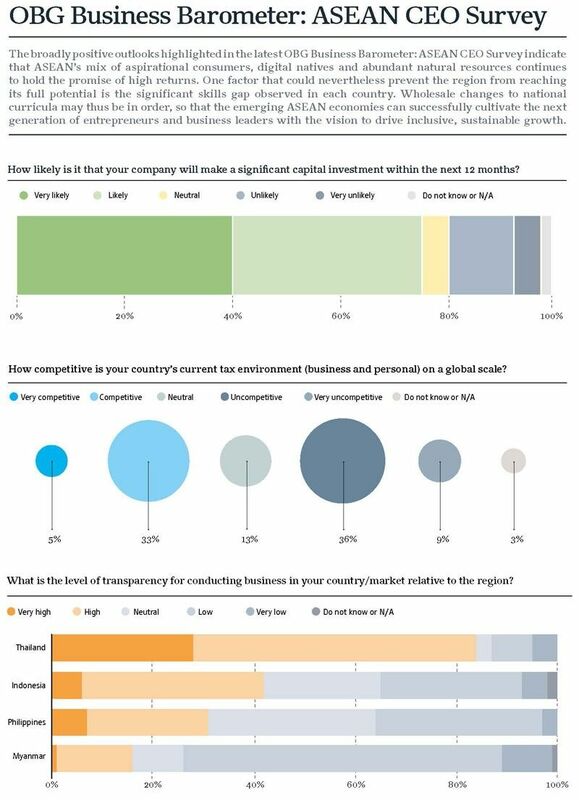 MANILA, Philippines — The 2019 OBG Business Barometer: Asean CEO Survey, which surveyed 400 C-suite executives from across industries in Thailand, Indonesia, the Philippines and Myanmar, indicated that executives across the region remain largely upbeat about the economic outlook in their respective countries. Results, however, became more varied when it comes to key domestic issues, such as the competitiveness of the local tax environment. The OBG report showed that executives in the Philippines were the most critical, with less than a quarter or 23 percent of Manila-based respondents expressing a favorable opinion of their domestic tax environment and 59 percent choosing negative responses. “Philippine CEOs responded at a time of tremendous disruption in the tax framework, with the government forging ahead with a comprehensive tax reform agenda designed to raise revenues for its Build Build Build infrastructure drive, while boosting the competitiveness of small and medium-sized enterprises, and expanding the provision of social services such as universal health care,” according to Patrick Cooke, OBG regional editor for Asia. “While these are all worthy aims, critics have–perhaps unfairly–linked tax reforms effected at the start of last year to the spike in inflation in 2018, and some are concerned that the proposed rationalization of investment incentives to offset the reduction in the corporate income tax rate will make the country a less appealing destination for FDI,” Cooke said. Results of OBG’s latest regional business barometer also showed that the biggest concern among Philippine CEOs is the rising commodity prices, compared to other countries, which cited a slowdown in Chinese demand as their major external concern. “Interestingly, Philippine executives are least concerned about a slowdown in Chinese demand, despite the concerted efforts of President Duterte to court Chinese backing for big-ticket infrastructure projects, which have so far resulted in headline-grabbing pledges but few tangible results,” Cooke said. “In a country where Chinese visitors are now the second-largest source market for the burgeoning tourism industry, and where real estate developers are increasingly reliant on Chinese investors and tenants, one might have expected more concern from executives about a decline in demand from its heavyweight neighbor as it grapples with US trade sanctions while attempting a seismic economic rebalancing toward consumption-led growth. But the biggest concern of Philippine CEOs is, in fact, rising commodity prices, with the steady increase in oil prices throughout much of last year contributing to a severe trade deficit and elevated inflation,” he said. Another subject that drew mixed responses was access to credit, in which 39 percent of respondents across all four participating countries describing it as easy or very easy, while 46 percent chose the opposite answers. OBG said while business leaders in Thailand and the Philippines were largely favorable in their views, the overall result was skewed by responses from Myanmar, where 81 percent of executives described accessing credit as difficult or very difficult. 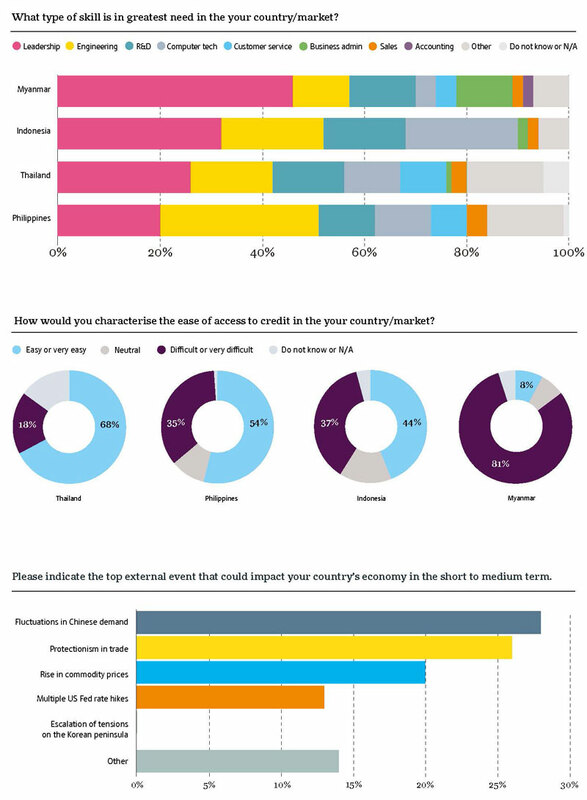 In the Philippines alone, 54 percent of CEOs categorized access to credit in the country as easy or very easy, with 35 percent citing it as difficult or very difficult. Cooke said the mixed results on questions related to the domestic business climate in the four countries surveyed reflected significant differences in domestic regulatory frameworks despite efforts to strengthen integration. He also noted that a lack of depth in the talent pool across all member countries could hinder future economic development unless skills shortfalls are addressed. In the Philippines, CEOs identified engineering and leadership as the skills they think are most needed in the country’s labor force. The OBG survey has been designed to assess business sentiment among business leaders and their outlook for the next 12 months. It was conducted by OBG staff on a face-to-face basis, across the full range of industries, company sizes and functional specialties. Robinsons Communities, one of the residential brands of Robinsons Land Corp. staged an open house event like no other.